The Moai Face rises like a wave of smooth granite out of the pines and crags of Mt. Mizugaki, Japan. Poised at the crest of this wave, Keita Kurakami lunges for a sloping hold in the middle of a 5.14a deadpoint move, six meters above his last gear. Preparation and practiced mental control pay off; he completes the move and finishes the pitch, one of several runout pitches on this new bold route. 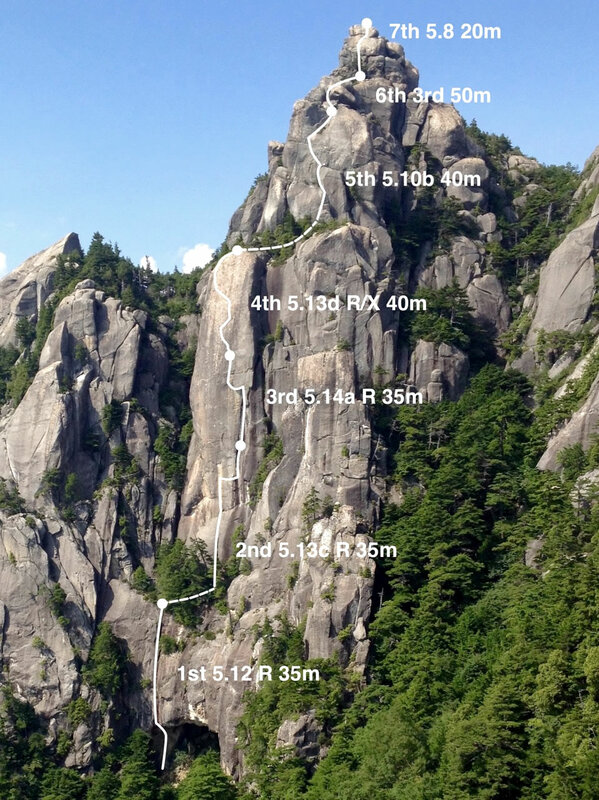 Over the past year, prolific Japanese climbers Keita Kurakami and Yusuke Sato authored the hardest multipitch trad climb in Japan, Senjitsu-no Ruri (5.14a R/X, 250m, 7 pitches), on the granite spires of Mt. Mizugaki (2230m). 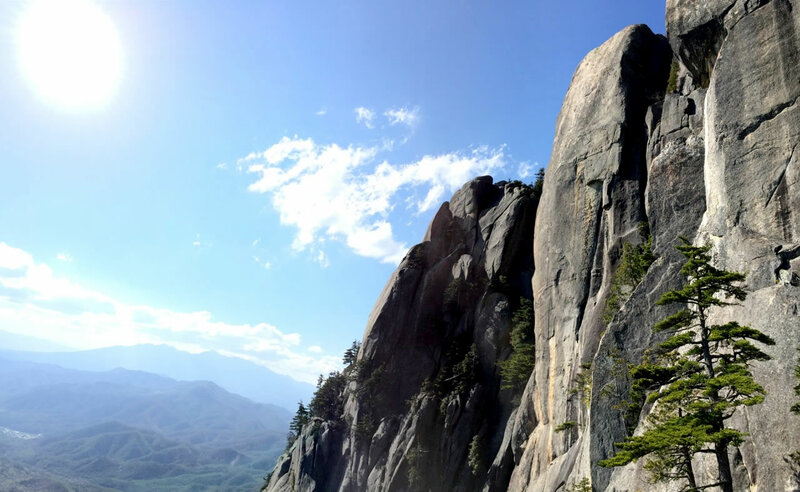 Located in the Oku-chichibu Mountains of Japan, this climbing area contains more than a thousand routes and boulder problems. The signature feature of Mt. Mizugaki is the Moai Face, a steep buttress of textured granite with very few cracks or protectable features. 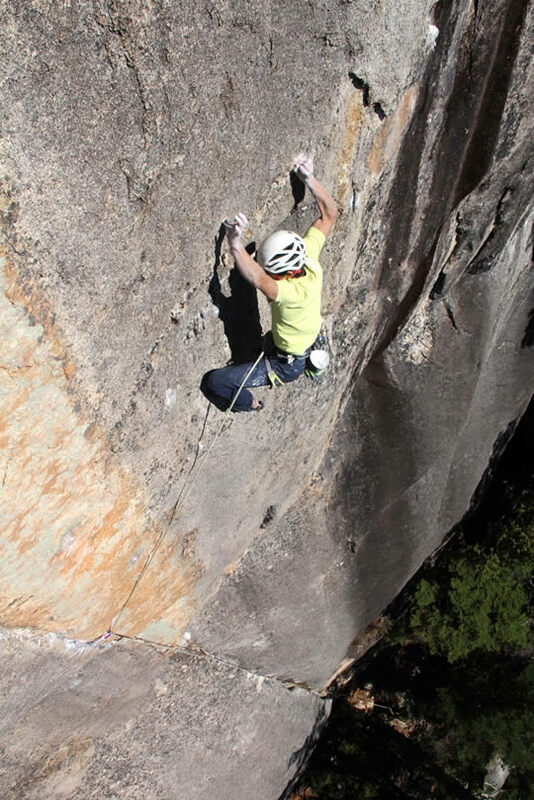 Kurakami dreamed of climbing this face and began a ground-up ascent last year, but he soon realized that the difficulty and lack of protection would require adding bolts to ascend in this style. This method was not an option for him, as it would depart from local tradition at Mt. 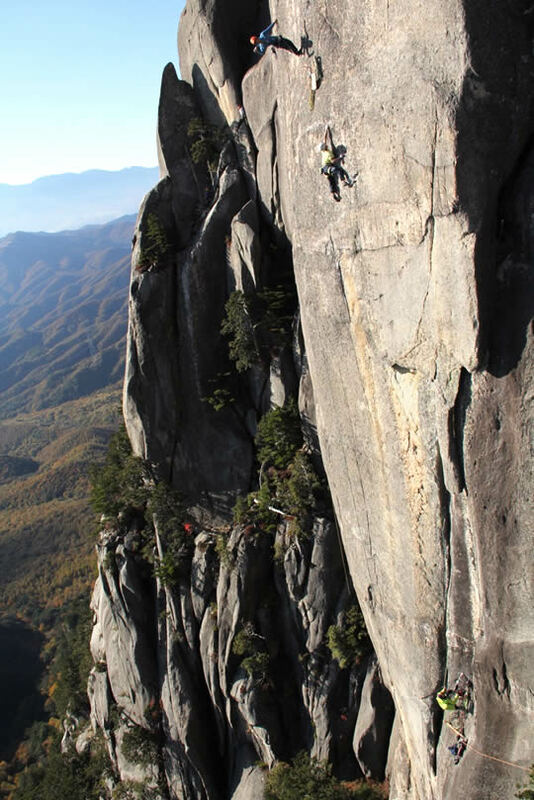 Mizugaki, where climbers place as few bolts as possible. "Thirty years ago, some strong pioneer climbers began to open some free routes without bolts," Kurakami told Alpinist. "This cleanest style has been respected and performed in this area ever since the late 1980s. Nowadays, when someone will open a new route around here, they consider climbing style very seriously." Following this ethic, climbing the Moai face would mean accepting runouts up to twenty meters on very difficult terrain. This high-consequence climbing would require precise preparation. Kurakami and Sato worked for six months to free the crux pitches of the Moai Face on toprope, beginning in May 2015. These three pitches proved to be 5.13c, 5.14a and 5.13d, with substantial runouts on each one. 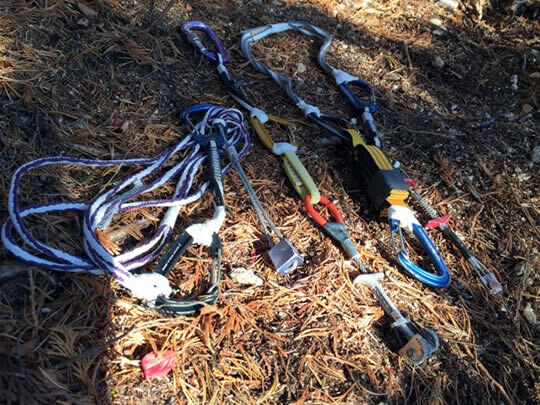 "I only placed four bolts as belay anchors," Kurakami said to Alpinist. 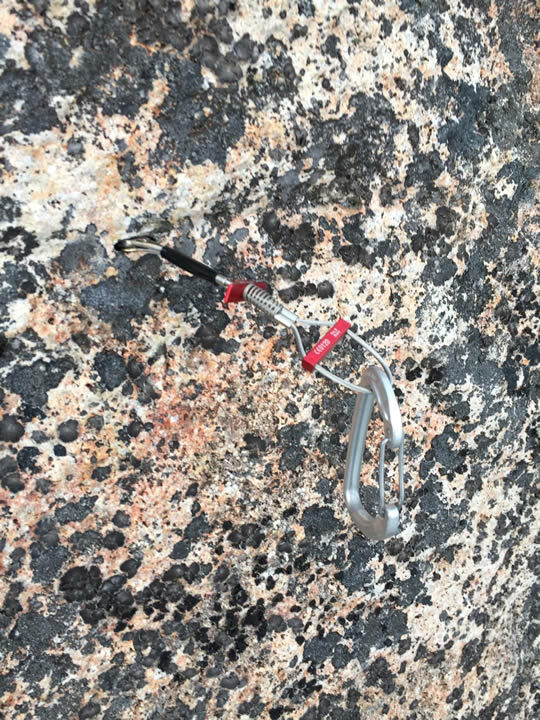 "I managed to climb all pitches without placing any bolt[s] for protection and only using natural protection—cams, nuts and sky hooks—to climb." On October 18, 2015, Keita Kurakami made a clean redpoint lead of every pitch. 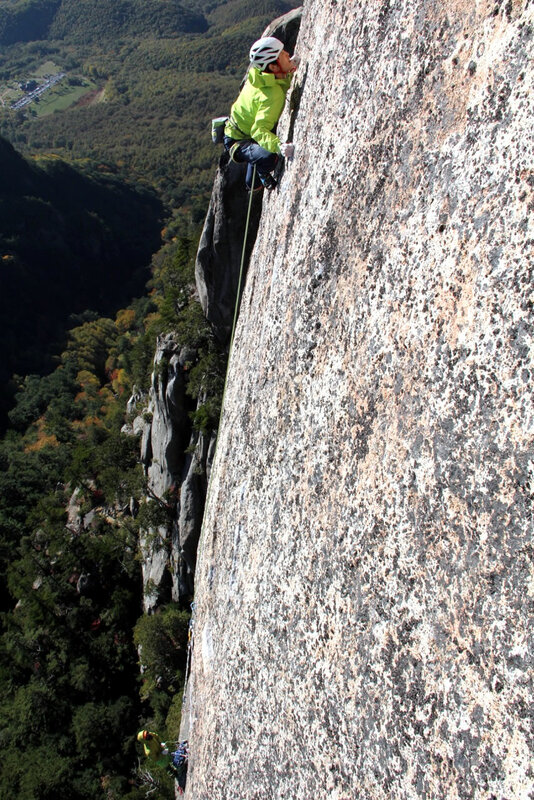 Yusuke Sato made the second ascent of the route in the same style on October 29. Kurakami named the route Senjitsu-no Ruri. The route name represents a culmination of his climbing career. Kurakami explains, "'Senjitsu-no' literally means 'thousand days,' and 'ruri' means the jewel lapis lazuli. I compared 'thousand days jewel' to a thousand days of precious experiences through climbing." On April 23, 2016, Kurakami and Sato returned to the Moai Face to make a one-day continuous ascent from the ground. The duo climbed the route free, with no leader falls. Keita Kurakami has established and climbed many high, difficult boulder problems, including the fifth ascent of Bansousha (8b, or V13) at Ogawayama, Japan in 2009. Last year he also established a traditional single-pitch route, Spark (5.13b R) on Mt. Mizugaki. 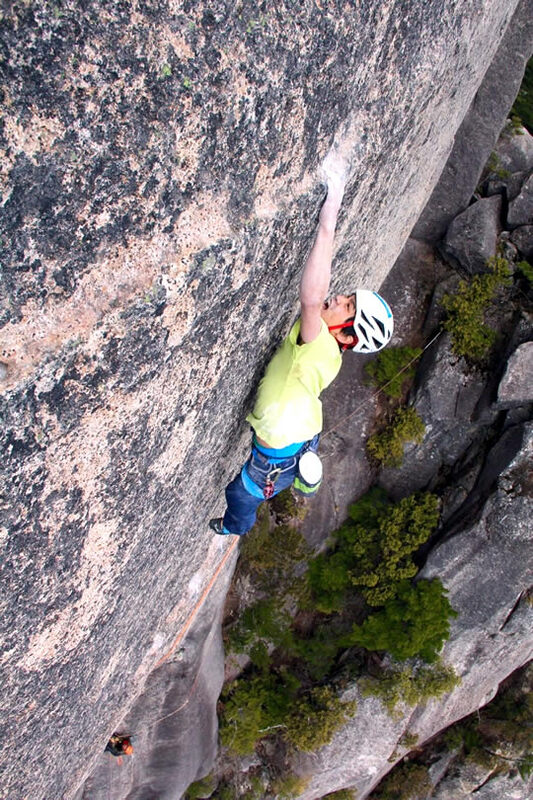 Yusuke Sato is a prolific climber and mountaineer; among other accomplishments, he joined Japanese teams in establishing new routes on the Bear's Tooth and in the Ruth Gorge in Alaska. In 2008 he received the Piolet d'Or award, along with Fumitaka Ichimura and Kazuki Amano, for a new route on the north face of Kalanka (6931m) in India.